The Repository of Arts, Literature, Commerce, Manufactures, Fashions, and Politics,, London, November 1816. 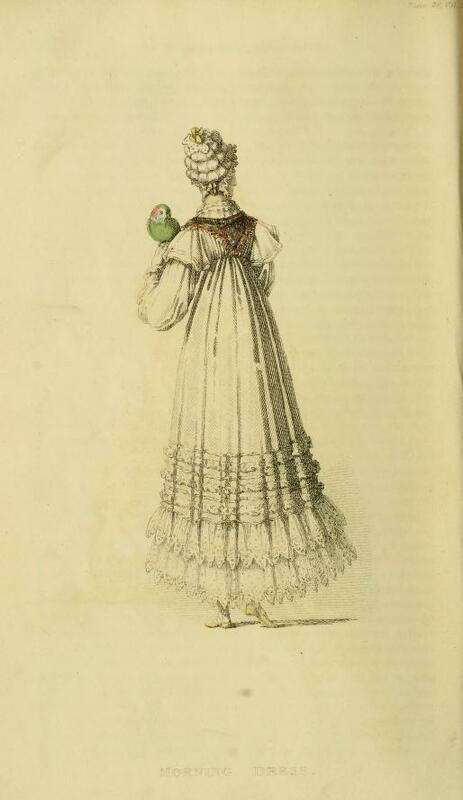 A round dress, composed of cambric; the skirt is finished at the bottom by four rows of rich embroidery and two flounces of work; it is very full, and the body, which is a chemisette, has also considerable fullness thrown behind. The body is made up to the throat, and trimmed at the neck with a double frill of rich work: it is made very full behind, but plain in front. A long loose sleeve, finished at the wrist by three puffings and a single fall of narrow work. Head dress a morning cornette, composed of fine clear muslin, with a border to correspond. The form of this cornette is uncommonly novel and striking; the crown is ornamented, something in the style of a turban, with rolls of muslin, and finished at the top by a bow of straw-coloured ribbon. Gloves and sandals of straw colour. A new pattern silk handkerchief thrown carelessly over the shoulders, completes the dress. I don’t think white cambric, muslin, and lace is a good choice for all of that deck swabbing, oakum picking, and parrot poop, but YMMV. Speaking of keeping tidy, which I’m all for: who thought it was a good idea to give a women’s fashion label the name “laundry?” That’s like calling your luxury chocolate brand “weight gain,” or your upscale gin “headache.” Who wants more laundry? Not me. Unless Shelli Segal is going to stop by and do a load for me, I don’t want to hear about it. ← Remarkable providences: A November tomato harvest?